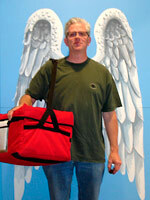 Join Our Flock of Angels and Earn Your Wings! 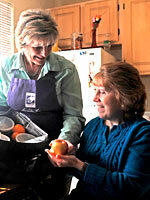 Our clients depend on our meals and on you. 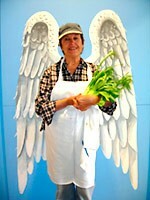 Join Our Flock of Angels and Earn Your Wings! Volunteering is a great way to give back to our community and to be of service to our neighbors in need. As a Kitchen Angels volunteer, you will have the opportunity to make a very real difference in the everyday lives of our clients. You will also meet like-minded community members, have fun, and make friends! Contribute your time, talents, and energy and join the thousands of Angels that have been a vital part of our organization since 1992. 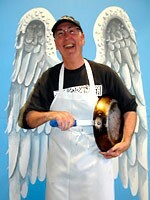 With only four paid staff, our volunteers are the heart of Kitchen Angels. All volunteers participate in an orientation program. Volunteer opportunities are listed below. No experience necessary. Angels-In-Training are always welcome! Please click on Volunteer Opportunities for a complete description and volunteer shifts and times for the different types of opportunities listed below. Duties: Preparing, cooking, and packaging meals. Duties: Pick up and deliver meals to clients on an assigned route. Duties: Assemble and package client meals for pick up by Delivery Volunteers. Duties: Variable, including preparing mailings, staffing an information table at a community event, gift basket assembly, special event hosting, and more. Call our Volunteer Coordinator at 505-471-7780 for more information. Click on the form below to complete if you are interested in becoming a volunteer. Volunteer Form 2019 Learn about food safety in this video.